The interwebs, in all their glory, tell you approximately nothing about this key question that you'll need answered to start making some plans. Are you going to get the straight scoop online? PS - If you don't want to read all this, or get bored, just click here and get a quick quote for rates to finance your box truck. And, the rates? You want to know that too? ...those fine fellows are being straight with you, right? -because we're about to get real up in here. 1. Can You Finance a Box or Straight Truck With Good Credit? It's no secret - financing companies love it when you make your payments. With good credit, you're in like Flynn, but there is a little bit of confusion about what "good credit" means. If you have all of those attributes, it's all good. Click here to get started. So what would your payments be? Assuming 2 or more years in business (we'll go over startups in a second) here are some approximate numbers for when you finance a truck. Note: We're going over payments assuming a $50,000 truck paid back over 5 years, and with no balloon payment at the end. Payments could be made cheaper with a lease - but you'd owe money at the end of the payments if you wanted to keep the truck. Now, if you're just getting business started, payments will be a lot higher. With good credit (or a strong cosigner) new businesses can usually get the equipment they need, but payments offered will make it seem like you were a bad credit risk or something. ...but this time let's assume your business is just getting started. Payments are high for startups, but as you can see if you've got good credit there's usually no problem in being approved. Plenty of very viable businesses exist that are not candidates for low-rate financing, but have enough revenues that they can still qualify. What this means is if you are buying a $50,000 truck, and your business does $50,000 or more in monthly revenues (as shown on your bank statements) in most cases you will qualify. The typical payments on a $50k vehicle with a cash flow based model are around $2,275 based on a three-year term. While the easy (cheaper) financing options may not be available after some of these events, collateral can fix almost anything. Business equipment, vehicles, or real estate that have a liquidation value (the amount the equipment would sale for at an auction) at least equal to the cost of the equipment you're buying, virtually anyone can qualify. The only deal breaker is if you are currently late on child support owed to somebody. 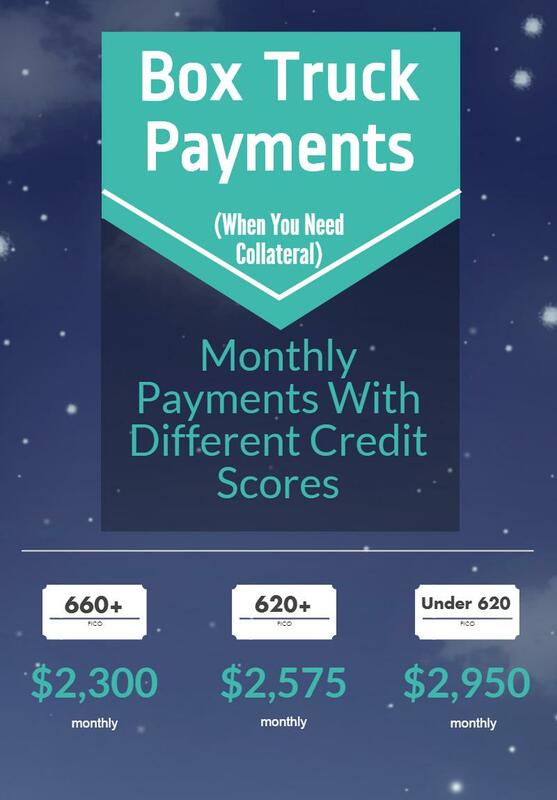 When a deal has to be structured around collateral, rates are higher, but they really depend on your credit score. Find out what your rates will be here. Also, payments will be higher as collateral based deals can rarely be stretched longer than 36 months. Let's go back to our $50,000 purchase, but we'll look at a 36 month term. What would your payments be? Yes - those payments sound pretty high. Why do you think nobody tells you the real payments? Since you probably don't have time to waste being lied to (or want to be scammed) those are the real payments no matter who you use when you've got some uglies in your credit file. If you've got it pretty rough credit-wise, but don't have collateral, there are still ways. The good thing about box trucks (or any business equipment that has tires) is that they hold their values pretty well. In most cases, if you stop making payments, the lender can recover about half of what you paid for the truck. (They end up auctioning the truck, and then have to pay repo, storage and other costs). If you have a 50% down payment, that works in 99% of cases. (Not for deadbeat dads, though). ..and when the deal requires 50% the answer is always "no." ... if your credit score is 550 or above and you have two or more years in business, story financing might work for you. Story lenders look for some strength to justify the deal, whether a down payment (but not always 50%) or collateral (but not always 100%) or some other method - and payments will be somewhere in the middle between all the other formats we just discussed. Note - "story lenders" can be pretty loose, but nobody lends on total garbage. If you have a credit score below 600, zero down payment, no collateral, and under $1,000 to your name, at least one of those issues has to be fixed before anyone will consider financing your purchase. To get started, give us a call at (866) 631-9996 or click the picture below.